Who can teach me to fly a microlight? Your tuition for the grant of a licence must be conducted by the holder of an instructor rating valid for microlight aircraft. Your examinations must be conducted by an authorised examiner. We have some of the most popular local clubs listed on this website. The BMAA have full listings of instructors and examiners. Is there a minimum age to learn to fly a flexwing? Tuition can be logged towards a licence from 14 years of age. Pilots may fly solo from 16 years of age and may hold a Licence from 17 years of age. There is no maximum age for a pilot. Yes you do. As of 2005 it is mandatory to carry third party and passenger liability cover. You can also add in “Hull” insurance to cover your aircraft (equivalent of Fully comp car insurance) You will be covered by your instructors insurance when training. How fast does a flexwing fly? 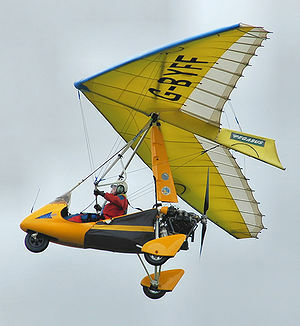 Most flexwing microlights fly at speeds between 50 and 80 mph. Some of the newer designs of fixed wing microlights however can fly much faster, over 100 mph. Whats the difference between a flexwing and a 3 axis (fixed wing) microlight? The difference between these types of aircraft is the method that is used to control them in flight. In layman’s terms – the fixed wing looks like a small aeroplane, and a flexwing looks like a hang glider with seats and an engine. 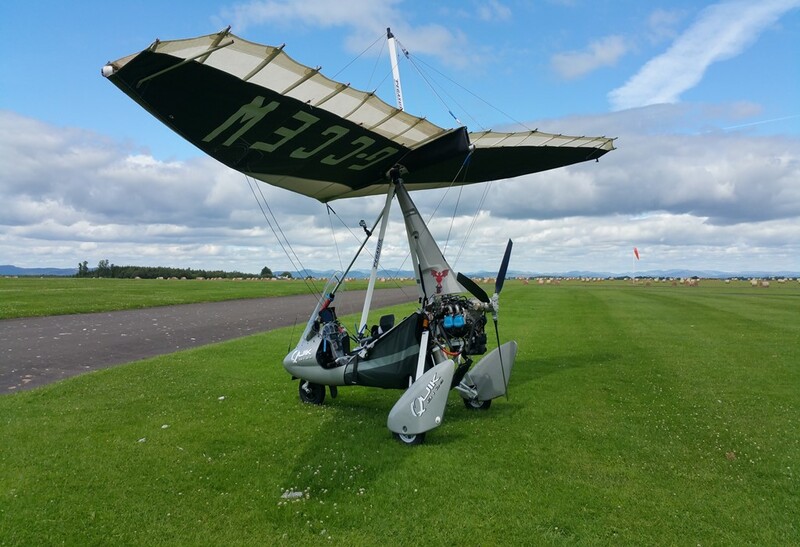 Flexwing aircraft use a system called weightshift which involves the pilot moving the weight of the trike unit, the body of the aircraft, under the wing to control its speed and direction. Three axis aircraft have control surfaces like those on a conventional aircraft, which are operated by a control stick and pedals. Most microlights have petrol engines which can run on unleaded petrol purchased from your local garage. Some of the engines are two strokes and require oil to be added to the petrol. What are the weather limitations for flying? Microlights are best flown in light winds, up to 15 knots, good visibility and not in rain. Microlights cannot be flown at night or in cloud. Some of the best flying of Microlights can be during the winter. The microlight licence requires at least 25 hours of flight training to include at least 10 hours flown solo. The normal time to reach the standard required to pass the General Flying Test is nearer to 40 hours than 25, although a very few people do manage in the minimum time. Always allow much more than the minimum. Just learn at your own pace..
Do I need to use the radio? Radio is not mandatory on any aircraft flying outside controlled airspace. Many microlights do carry a radio for communication with ground stations. The radio must have a licence, and the pilot must have a licence to use the radio. You will learn to use the radio with your instructor. Being confident using the radio is all part of being a pilot, and air traffic services are there to help you. Pilots will always take off and land into the wind where possible. This will give the most lift on take off, and the most resistance when landing. When the wind is blowing straight down the runway, it helps the pilot. If the wind is blowing across the runway (Crosswind), it can make it much more challenging, as the aircraft will be blown to one side, which makes landing much more difficult, especially for students. This why, Airports such as Perth which have 3 different runways (6 different approaches) all pointing in different directions have much more ability to cope with the wind, as they can change runways to suit the wind to reduce crosswind landings. Wind direction can change constantly, which is why the windsock is so important for aircraft in the air as well as on the ground.